Awesome Box was an Amazing Experiment. Thank you! Awesome Box was a highly successful experiment that helped LIL explore new ways of enabling peer to peer reading recommendations in libraries. The Awesome Box was a physical box that a library would sit next to the library’s regular returns box and if you thought the book was mind blowing, you dropped it in the Awesome Box instead of the regular returns box. The librarian then has the option to scan the book into the Awesome Box website to enable digital sharing of lists of awesome items. Or, the librarian can keep things no-tech and put the item on a shelf labelled Community Recommendations. Annie Cain and I created the Awesome Box after hearing about a similar idea functioning in a European library. In 2013, we developed the web app, received a little grant funding from Harvard’s Library Lab and the Arcadia Fund, and started collaborating with libraries at Harvard, Somerville Public (first Awesome Box in the wild!! ), Cambridge Public, and Brookline Public here in the Boston area. Annie and I (with Annie doing the lion’s share) worked hard to develop the Awesome Box community by quickly replying with advice when emails arrived and talking about Awesome Box at several conferences and gatherings of librarians. I learned a ton about product development and adoption with the Awesome Box, but two big things that stick out after much reflection — make the thing you’re building fit with the patterns of the folks that will use the thing (people are returning books anyway, they just need to choose a box), and you have to sell, sell, sell! 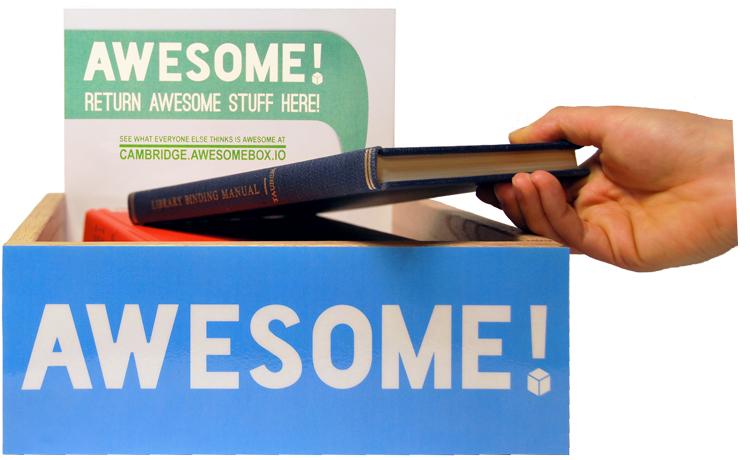 Awesome Box is fun and free (as in open source and as in no money) and we still constantly talked it up and pushed it for three years. I’ve found that it’s hard to find success with a project if you just dump on the web and expect people to use it — you’ve got to wire people to your project. Awesome Box is certainly one of the most successful projects I’ve been lucky enough to be part of. And, arguably, one of the most successful projects to roll out of LIL. Thank you so much to all the libraries that joined together to make Awesome Box so much fun! If you’re a library and you didn’t have a chance to export your Awesome items, please drop me an email and I’ll get your data to you. Awesome Box was an experiment. It’s done and the servers have been powered down. During it’s glorious run, the Awesome Box supported 512 private, public, and academic libraries across the US. The members of those libraries dropped 104,715 items dropped in the Awesome Box from 2013 to 2016.